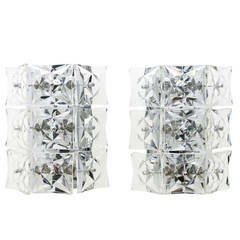 A beautiful pair of 1960s sparkly, thick, Austrian crystal sconces with chrome fixtures by Kinkeldey, newly rewired. A wonderful pair of large 1960s Austrian crystal sconces composed of a white enamel fixture and chrome fittings holding rectangular crystals. Rewired. 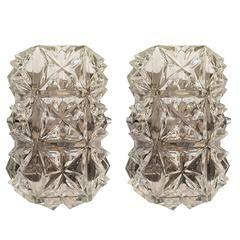 A luxurious pair of gold-plated frames and thick diamond crystal sconces by the famed Austrian maker, Kinkeldey. Two light sources. Rewired. Original label. 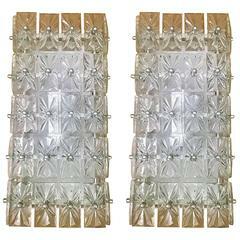 A pair of 1960s Austrian textured glass sconces with polished chrome fittings. Rewired. 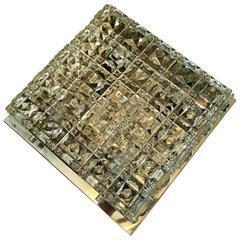 A beautiful 1960s Austrian hand-cut crystal and polish chrome flush ceiling light by Kinkeldey. Newly rewired. A pair of large wall sconces by Kinkeldey. 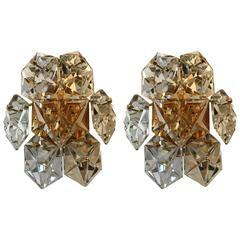 Crystal star faceted and chromed metal. 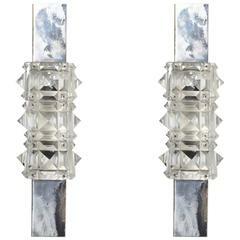 Pair of crystal glass wall sconces by Kinkeldey, circa 1960s, Austrian lighting. A pair of large wall sconces by Kinkeldey. Crystal glass and metal. A second pair is also available. Excellent condition. Worldwide shipping.